I am embarrassed to admit that I had a major of a breakdown last night. I knew that come morning I’d have to remove my bandages and clean The Wound and I was really, really, really not looking forward to it. I sobbed hysterically and got really carried away with my self-pity party. The dreaded moment arrived and was not as bad as I’d built it up to be, so my apologies to my mister who had to suffer through my hysterics. 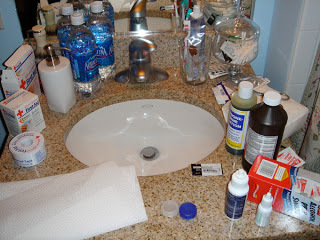 As you can see below I had a little emergency room all set up in my bathroom – and don’t you think I did an excellent job of bandaging my hand? I had a little accident yesterday. 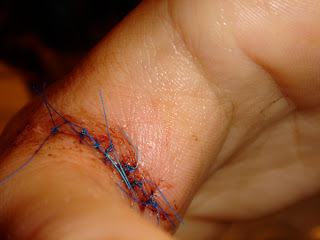 While coring a cauliflower, it slipped and the knife I was holding slashed open the webbed part between my thumb and the rest of my hand. It all happened very quickly, and I was only able to see what had happened for a very brief moment. It was almost like a camera, blinking its shutter open only to capture one essential and fleeting moment. That quick look revealed more than enough, however, because the image is firmly rooted in my mind’s eye – a piece of raw, bloody steak peeking out from underneath my skin. It was quite shocking; I shrieked and then everything started to go dark. My blood pressure dropped and I nearle fainted. Normally I seek cheap thrills in the form of horror movies and medical programs, but I suppose perception changes when you are the bloody victim. My mister answered my distress call and I had him wrap my hand in paper towel and duct tape and off we went to the emergency room. It took two hours for a doctor to see me…ample time for the bandage a nurse had wrapped around me to dry and crust itself onto my cut. I was still queasy and dizzy, in addition to freaking out about possible nerve and/or tendon damage, so you can imagine how much I was dreading peeling off the bandage and looking at The Wound once again. But I did it, and hard though I tried to keep myself together, I yelped and nearly tossed my cookies again. It was so…meaty. 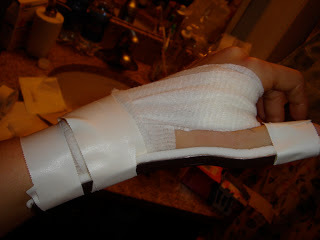 I went home high as a kite on Percocet with seven stitches and a splint to keep my thumb from moving. 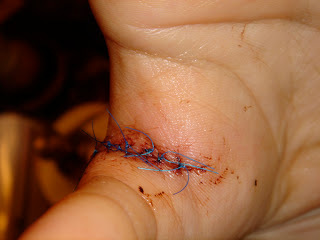 I went to bed with visions of the stitches bursting open revealing once again The Wound. No pictures, unfortunately. Even in my distraught state I considered taking the camera along, but it just didn’t happen. I’m supposed to remove the bandage tomorrow – God help me: it is, of course, glued to the blood that seeped out through the crochet job I have on there – and if I don’t faint I’ll try to document the proceeding. Hopefully there will be no meat. I’ve been absent for a few days, but with good reason! I had several tests in the span of a few days and I needed to study. But now I am back and eager to share what I’ve been eating – errr, I mean, preparing. Since the lobster episode, we’ve made a number of tasty meals at school – suprême de caneton sautée et cuisse braisée à l’orange (sautéed duck breast with braised duck legs and orange sauce), poulet sauté chasseur (sautéed chicken, hunter style), poulet rôti grand-mère (roasted chicken, grandmother style), contre-filet grillé / sauce choron (grilled strip with a béarnaise-like sauce), to name a few. It’s been a veritable smorgasbord of meats and butter, and yes my friends, potatoes once more! I’ve been trying to eat small portions, but regardless of the efforts, I confess: I eat all day long. The most piggy of my days was the day we had the contre-filet with the sauce choron…and fries. I had, aside from the steak, eaten a grilled chicken preparation earlier in the day. It was delicious and I ate a full plate. In an attempt at daintiness, I vowed not to eat the steak, but failed miserably. I ate the whole steak. And the potatoes. Now for the kicker: When I got home that afternoon, my mister, in an attempt at satiating my constant craving for read meat, had a piece of skirt steak waiting. I sighed, gulped, and quickly reviewed my options. Rather than politely declining to eat meat, or anything else for that matter, I decided to not be a sissy and do the right thing: MAKE BEARNAISE FOR THE STEAK. Admittedly, I had been making up excuses not to attempt to make the beastly béarnaise after the previous debacle, but this was my chance to redeem myself. Today was Potato Day, and what a day it was. I must have consumed at least 7 kilos of potatoes and 8 liters of butter. (Note: I’m trying really hard to use the metric system as all school recipes come in that format. That’s about 15 lbs. of potatoes and 33 cups of butter). By the end of it all, I was ready to wave my white flag. Turns out it’s true that one can have too much of a good thing. We started with your basic pommes purée, then moved on to pommes duchesse, followed by pommes dauphinois, pommes Anna, pommes sautées à cru, and finally pommes gaufrette. Chef warned us about pacing ourselves – I guess there have been other Tuber Gluttons before us – but it is doubtful that anyone heeded his advice. I certainly did not, and by 10:15am I had consumed my first preparation (needed more butter). Pommes duchesse (the pretty piped ones you find on your plate at a fancy restaurant, or at the farthest end of the spectrum, in a TV or airplane dinner) were next. They were rather lovely to look at but not much in the way of taste. Butter, you say? Alas, no. Duchesse is more about presentation. If you add butter the mix won’t be stiff enough to pipe out through your pastry bag. (I ate a few of my toasty pipings anyway). Pommes dauphinois: Thinly slice peeled potatoes with a mandoline. Toss in bowl with cream + milk + minced garlic + nutmeg + S&P. Place mix in buttered pan, simmer on stovetop, and continue to cook in the oven. When the potatoes are almost done, sprinkle top with gruyère + butter and brown. Sounds good, right? It was. By this point I was feeling a bit full, but Potato Day comes only once in blue moon and I was going to see it through…or eat it through. Pommes Anna were extremely pretty and very, very tasty. The sautées à cru so-so, but po-tay-to, poh-tah-to, I like them both. My confidence lingered on and I set out to replicate my better-than-thou béarnaise in the comfort of my own home. 1: Clarify some butter: Check! 2: Prepare reduction of dried tarragon, white wine vinegar, and minced shallots: Check! 3: Finely chop fresh tarragon and chervil: Check! 4: Whisk two egg yolks plus a splash of water in a bowl over a boiling pot of water: Check! 5: Whisk until a lovely, frothy, pale yellow sabayon comes into being: Check! 6: Slowly start pouring in clarified butter while whisking like mad: Check! 7: See glorious, velvety, very French sauce materialize: Houston, we have a problem. Well, that’s being overly dramatic, but I am admittedly feeling really depressed about the broken béarnaise. Stay tuned for the sequel when I tackle the wretched recipe later on this week (I’d try it again tomorrow but I’m not allowed to eat red meat two days in a row, per my mister). Last week in school we devoted two days to fish. We prepared round fish and flat fish in a number of ways and it was extremely rewarding to start with a whole fish and end with a snazzy presentation. So impressed was I by one of the preparations that I made it last Sunday as a special treat to dazzle my mister (I know, I know – I still have to tackle beastly béarnaise. Soon, I promise!). I started writing this post a few days ago and had the full intention of writing down step-by-step the instructions to make “poisson en papillote,” however, what began as a simple how-to quickly evolved – or devolved rather – into a three-volume novel. So I tossed it – well, actually, most of it is saved and if anyone would like the recipe, jus ask – and decided instead to do an illustrated guide to poisson en papillote. Click here to check out the 54 photos that comprise the recipe. Let me know what you think.